Following the launch of our CSR programme earlier in the year, we are providing children in disadvantaged situations with learning materials as part of their ‘Giving Hope through Education’ project. 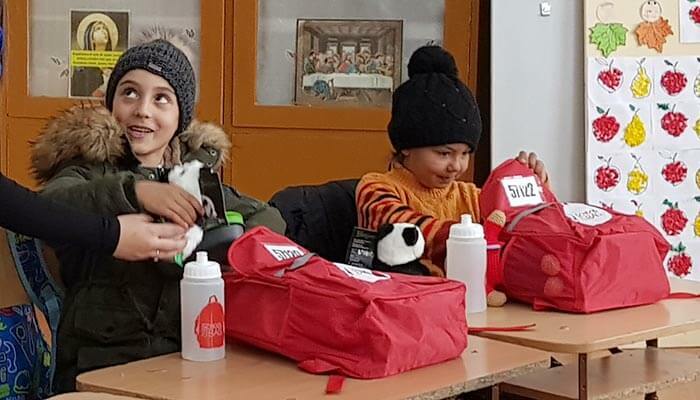 During November, some of our team travelled, in collaboration with School In A Bag and Te Aud Romania, to North-Eastern Romania to visit an orphanage and a school. Romania is an unequal country with much of the wealth and economic growth focused in the major cities. In rural areas there are high levels of poverty. The team visited the orphanage first where they were able to give each child their own schoolbag packed with enough learning materials to last them at least a year, which we had all packed earlier in the year. Every child also chose their own Blake soft toy to keep. While Tim and Darby were at the orphanage they worked with the children to create notecard designs that The Blake Foundation will be able to sell to raise further funds for the orphanage. “I consider the workshop important to my evolution because I managed to prove that I am talented and I put passion in everything I do. The workshop taught me to be a better person and have more confidence in myself day by day. It motivated me no end to learn that my work is not pointless. Thanks for all!” Nicoleta Stiglet , a child at the orphanage (translated). Nadia Cretuleac, Head of Child Protection Services for Suceava County said, “The opportunity that Blake Envelopes has offered to the children we support is immeasurable and will stay for them for life. Having your designs implemented by such a reputable company meant so much not only for the children, but for the institution itself. I truly appreciate their visit”. The next day, they set off across the snowy countryside to the rural village of Giulia. At the school they were able to personally hand out the 226 bags to each of the children. The bags will give all the children equal resources and opportunities to learn. We’re hopeful that we will be able to continue to support these children through the foundation.